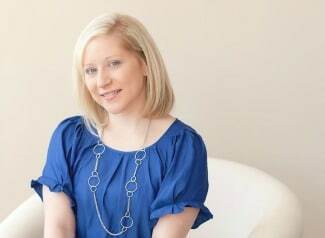 Having a Minecraft themed birthday party? 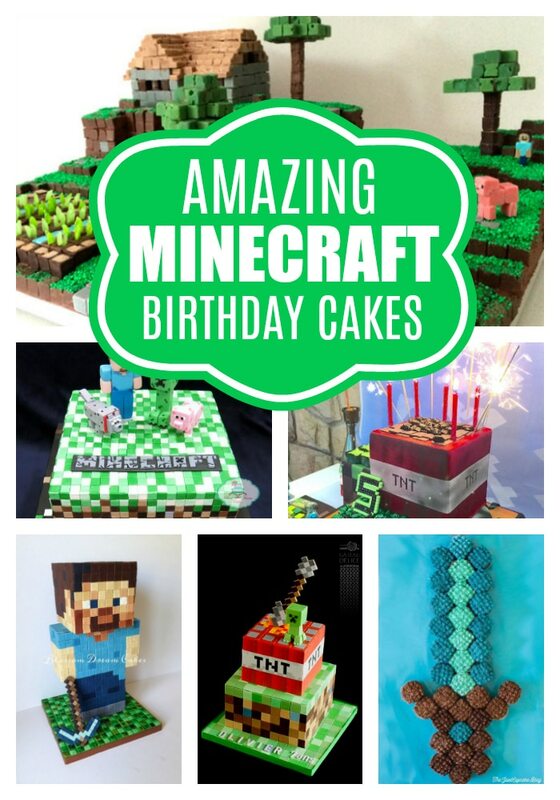 Get some fab cake ideas with these amazing Minecraft birthday cakes! Even after so many years have passed since it was initially released, the 3D pixelated world of Minecraft is still such a massive hit. In fact, as of mid 2018, Minecraft boasts 91 million monthly active players! How astounding is that? Minecraft is something that can be enjoyed by boys and girls of all ages, so Minecraft birthday parties also soared in popularity. Of course, a Minecraft birthday celebration would not be complete without a Minecraft birthday cake. 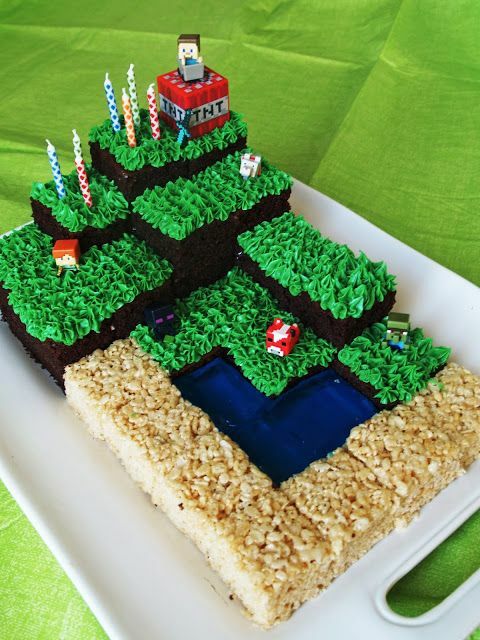 Need some Minecraft cake ideas or maybe some steps on how to make a Minecraft birthday cake? 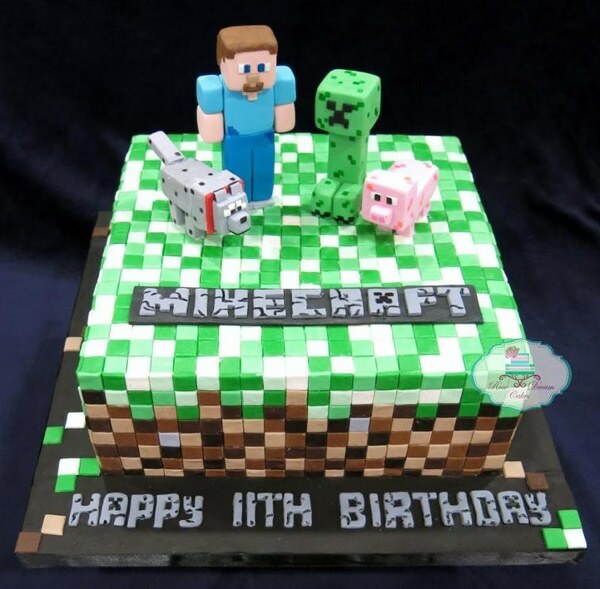 Whether you just need some pictures to show to your local baker or you’re looking to try your hand at a DIY Minecraft cake, these 11 amazing Minecraft birthday cakes will definitely keep you inspired! Minecraft Cake Design #1: This Minecraft Cake is an awesome complete representation of the super popular 3D cube world! 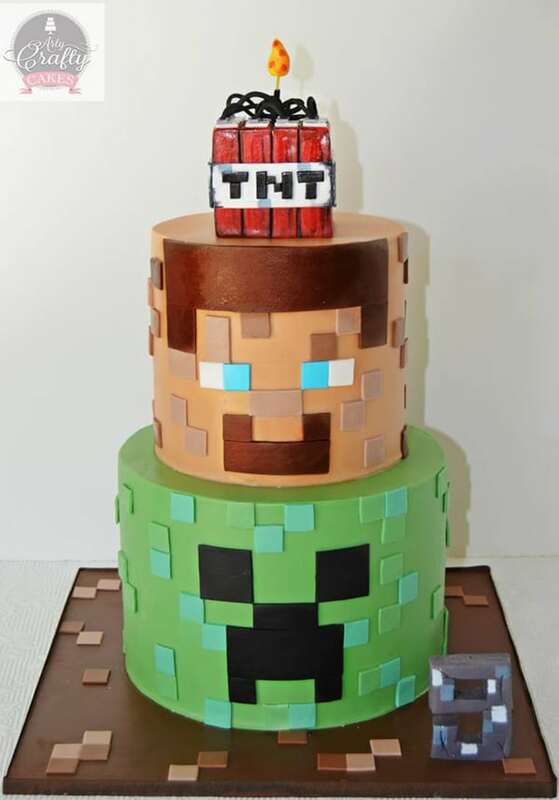 From main characters Steve and Alex to the infamous creepers, from the cute little TNT to the adorable wolves that spawn in the game, the level of detail in this brilliantly designed cake makes it such an amazingly realistic one! 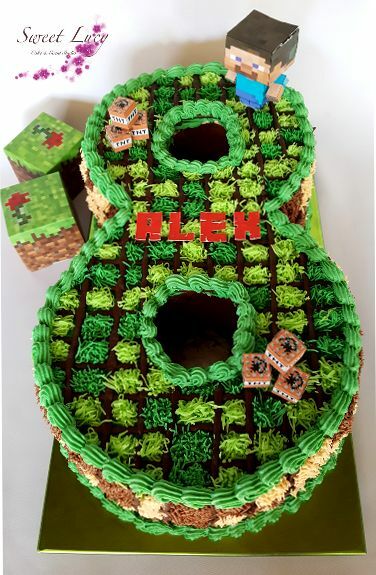 Your guests will be stunned when you have this amazing cake for your Minecraft themed birthday party! Minecraft Cake Design #2: Want a Minecraft Birthday Cake that’s a bit of an upgrade from your regular Minecraft sheet cake? This adorable cake is a great one to try baking yourself! What’s super cool about this cake is the creative use of different textures. From the rice krispie “sand” blocks to the deep blue jello “water,” this cake makes use of a lot of creative ideas that makes it truly unique! The “grass” icing looks beautifully piped as well, and those little familiar Minecraft character figures really complete the look. Minecraft Cake Design #3: How gorgeous is the fondant work on this Minecraft Creeper Cake? Everything looks so precise and perfect! 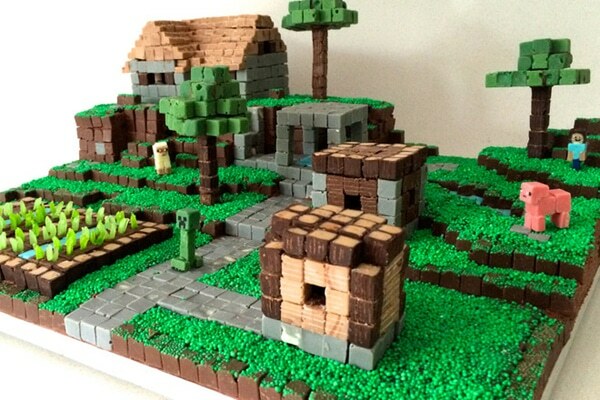 Now, this is a cake that looks perfectly cubed just like in the real Minecraft world. 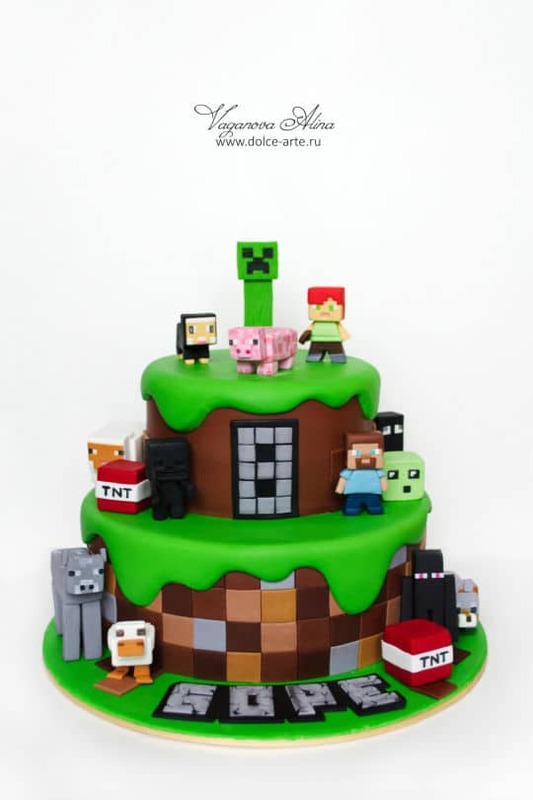 If the perfectly pixelated look of this tiered cake isn’t enough, the Minecraft-specific elements like the TNT and the creeper topper will leave no doubt that this is an awesome Minecraft cake design. Minecraft Cake Design #4: This spectacular, towering Minecraft Birthday Cake is definitely going to be the center of attention at your Minecraft themed birthday party! 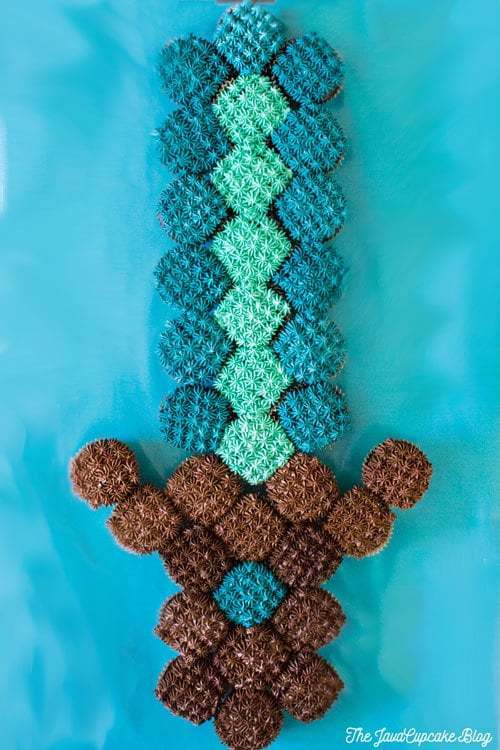 The amazing sword detail looks really good and the Steve, TNT, and creeper cake toppers are really well made! And how cute is the little wolf detail?! 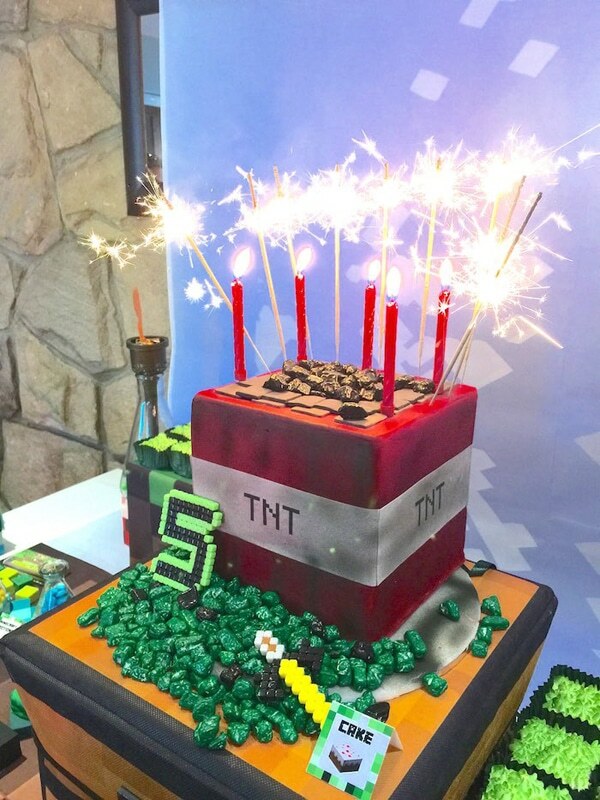 Minecraft Cake Design #5: This Minecraft TNT Cake looks awesome! If you want a relatively easy (compared to some of the quite complex Minecraft cakes on this list), then this tiered Minecraft TNT cake is a great place to start! Minecraft Cake Design #6: How awesome does this Minecraft Sword Cupcake Cake look? 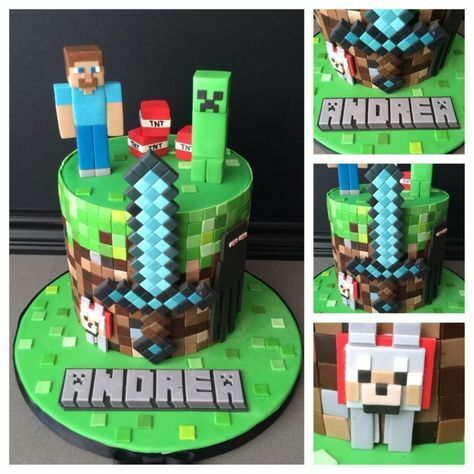 If you want to have a really cool Minecraft sword cupcake but don’t want to bake a gigantic cake, this cupcake cake version is definitely going to be a great alternative for you. A Minecraft cupcake cake can be the perfect solution if you’re a rookie baker looking for an easy Minecraft cake for beginners. You can even use a tried-and-tested store-bought cupcake mix for the cupcakes themselves. Just keep the piping and the colors perfect on your cupcakes and you’re good to go! Minecraft Cake Design #7: This Minecraft TNT Cake is the BOMB! All the little details and Minecraft cake decorations present in this little number makes this cake such a blast! Using sparklers on top of the regular candles also adds a bit of excitement to the party! Don’t restrict yourself to cube fondant for decorating your Minecraft birthday cakes! Just look at how amazing the addition of green rock candies looks on this TNT cake. The cute grass cupcakes on the side would also be an excellent addition to your dessert table at your Minecraft birthday party. Minecraft Cake Design #8: Steve, the infamous Minecraft creeper, a cute little pig, and a chubby dalmatian make up this super cute Minecraft Birthday Cake. The character cake toppers will be a challenge, but the rest of the cake should be straightforward enough to make! If you love decorating with fondant and you don’t mind cutting dozens of tiny squares to cover this massive cake, definitely try this one out. Minecraft Cake Design #9: Looking for non-traditional Minecraft birthday cakes ideas? How about a Minecraft Number Cake? 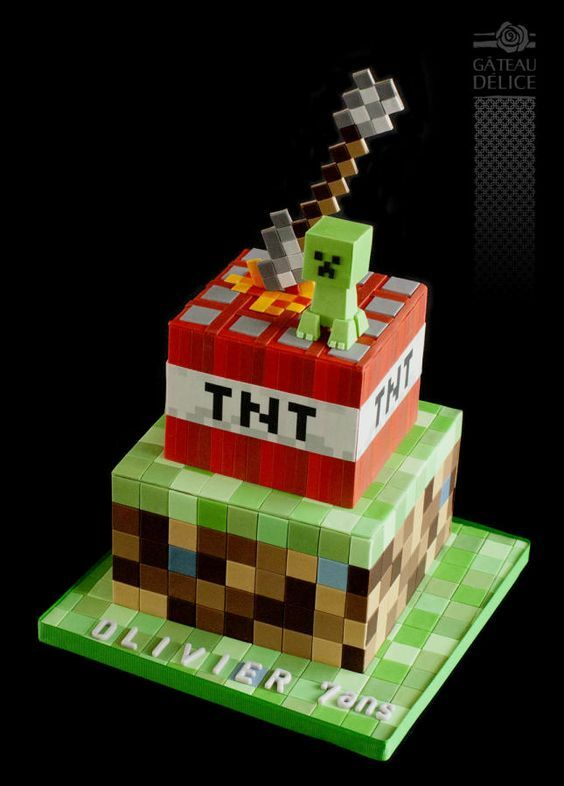 The super cute TNT cubes and the good ol’ Steve cake topper makes this cake unmistakably Minecraft. How realistic are those patches of “grass” though? Really excellent piping work takes this cake up a notch from a simple number cake to the awesome 3D cubed world of Minecraft. Minecraft Cake Design #10: Are you Steve or Alex? This Minecraft Birthday Cake features one of the beloved Minecraft characters. 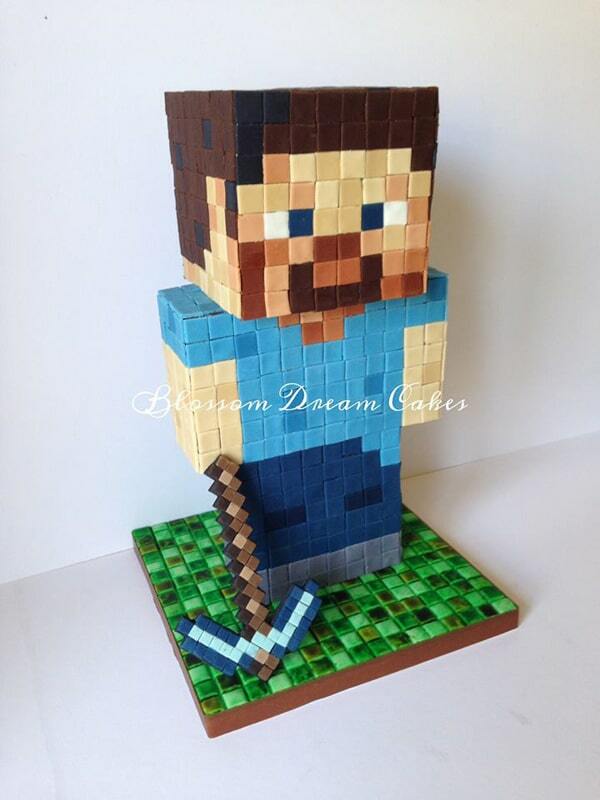 If you’re a fan of the Steve skin, this Minecraft Steve cake is perfect for you! The cube fondants are precisely cut which makes this 3D cake look clean and sharp. The awesome work on Steve’s pickaxe is also very impressive! Minecraft Cake Design #11: This Minecraft Village Cake looks absolutely incredible! If you’re looking for Minecraft cake decorating ideas that will leave your guests gobsmacked, try recreating this amazing and incredibly detailed Minecraft village cake. Although the cake still contains the essential 3D cubed design that’s all Minecraft, the different textures used for the grass, wood, and other elements of this little village makes everything so lifelike! Don’t forget to add the essential Minecraft characters like Steve, creepers, animals, and so on. Have you chosen your favorite Minecraft cake of the bunch? Are you looking forward to trying your hand at baking one of these cakes? Don’t forget to share your own Minecraft birthday cakes with us by leaving a comment below!